It may be common knowledge by now that Facebook Groups are where you build relationships through good old fashioned authenticity (which is why we absolutely love them! ), but did you know that not only can you provide valuable information and genuine support in a group, you are also able to host events right inside your group that will inspire, intrigue, educate and help others? It’s true! Facebook Events held inside a Facebook Group have many benefits! Interested to find out what those are? Well, you’re in the right place at the right time, because we’re about to break them down for you! Keep in mind that the same guidelines that apply to a group also apply to the events held within the group which is that in order to see the posts/content, the event guest must be a member of the group. Think of it as entering a wedding venue (group) and then going to the reception hall inside that venue (event). You can’t eat the cake if you aren’t in the right room! Now, let’s see how much fun everyone can have in all these different “rooms”! Inside your existing customer group you can throw an event that will showcase your latest goods which will highlight the products that you want to feature. It’s a super easy way to share what your current specials are with your existing customers that are already members in your group without having to invite them to a separate location to check everything out! Another exciting thing you can do with an event inside your customer group is host your own Mystery Host party where anyone attending has the chance to win the hostess perks from the party sales! Say what?!? Who wouldn’t want to join in on this? A crazy person, that’s who! Are you trying to move some inventory or have a team incentive trip coming up? Host a flash sale right inside your customer group and everyone will come running! Post time sensitive pre-posts on your group wall like, “Going out of stock!” and “Last time to shop before they’re gone for good!” along with, “You don’t want to miss these awesome deals!” and see them flock to your event to check out your amazing sale! Do you have a niche group for health, wellness or perhaps beauty or parenting? No matter what your group’s purpose is, adding in events is a fantastic way to reach your existing members in a whole new light, by way of educating them about your products and services. Share how you can help them improve their lives by hosting classes/workshops that they can attend to LEARN, not purchase. You will be surprised to find that when people become more knowledgeable about your products and personal testimonial (as well as others you’ve helped), they will naturally WANT to become loyal, long term customers. Once a month or so in your customer group, or as a stand alone group, you should host opportunity events to share your Why with everyone and explain how your business has allowed you to live the lifestyle you’ve always dreamed! Not there yet? Be transparent and tell them that you’re working toward your goals and have an amazing team, and that together, you’re going to make it happen! They should join you for reasons A, B, and C and be sure to include photos from incentive trips, team retreats, and company conferences as well as the moments that made you join yourself (for us, it was to spend time with our kids). We have a blast doing what we do! Why not let others know that they can join in on the fun too? If you’re a team leader, you most likely have a Facebook group for your team so you can help them grow their business. Hosting events as trainings inside your group will show them how they can not only learn the best strategies for success but also how to assist their own team as it grows by using your mad training skills (we mean mad in a good way of course!) and implement your tactics in their own groups! We’re here to help YOU too! As a CinchShare Brand Ambassador, you have access to our shared folder which houses our Cinch101 complete trainings (that’s a full script with post messages and graphics!) for you to schedule as an event in your team group to teach them how they can save time and work smarter with us! 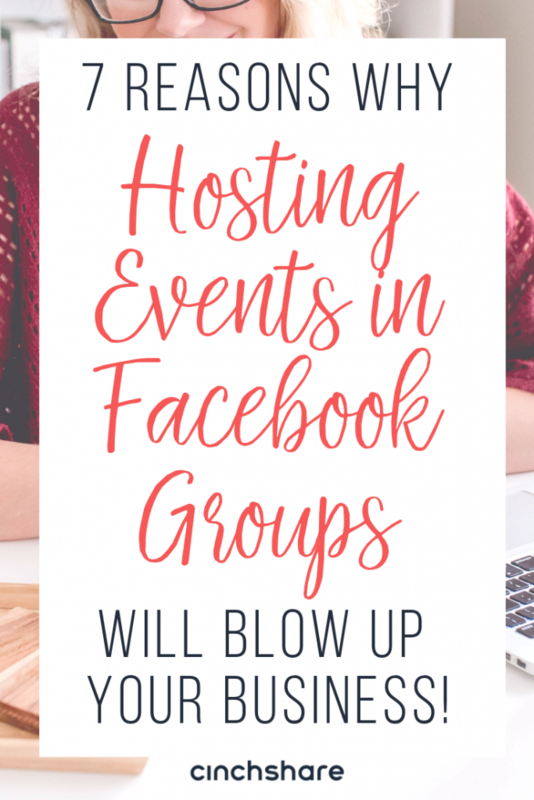 Hosting an event inside a group comes with great perks too, such as increased engagement because it’s held within a group, privacy and exclusivity for your guests which is important to attendees (not everyone wants their friends to see what they’re doing and shopping for on FB!). Events also keep your posts in order, which many people prefer if they don’t want to number them. Basically, you receive ALL the benefits of a group while hosting an event and we absolutely LOVE that! Simply add your host to a group you created for her party and all she’ll have to do is send them a link invite via private message or click on Invite with Facebook’s new update, and you can put the pre-posts in the group while people join then throw the live party in the event. It’s a great way for people to learn more about you, your WHY and shop! All of these reasons are guaranteed to blow up your business! Why not give them a try? 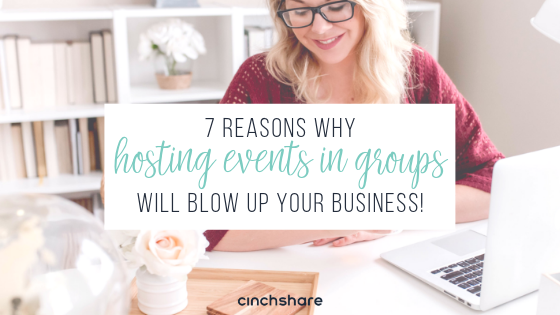 It’s so simple when you can schedule your entire event inside a group so you don’t have to worry about errors, power outages, kids not co-operating, hungry hubbies or what to post next – and you’ll be 100% available to engage with your guests and group members! That in itself is pretty amazing right there! We can’t wait to hear how your group events are going – be sure to share with us below or join us in our SocialCinch Club where we host our own events all the time! You should definitely check one out!